Discussion in 'Transformers Toy Discussion' started by Gigatron_2005, Feb 21, 2006. 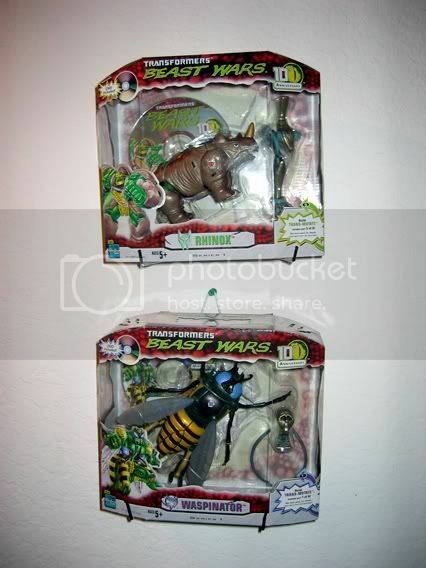 Well, I go to Target today, and happen to see Beast Wars 10th anniversary Rhinox and Waspinator. I eagerly pick them up, along with a Alt Sunstreaker. So I get home, take a look at the Beast Wars toys... There are no pegs for me to hang the boxes on the walls with. I was a little let down by that, since I like to display my MISB toys on the wall. So I mention the problem to my neighbor today, and in exchange for me seting up some stuff on his new PC, he made me some hooks to display the toys. 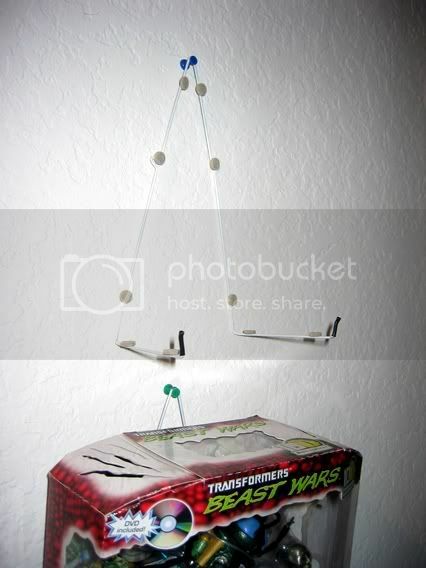 The hooks are made of wire hangers. Felt pads are added everywhere the box would touch the hook. Melted rubber is at the ends of the hooks so that it does not scratch the box. Fishing wire will be wraped around the box so that there box will be secure. The things hold the boxes very nicely. note: not the final position or placement. Anyone else have any other ways of displaying these 10th anniversary toys? I really love how they look in the boxes, and I think they look great suspended on the wall. Boo Addicted to candy canes. Whoa... that looks like a great idea. My 10th Anniversary BWs, as well as all my MISB stuff is just stacked neatly on top of a small bookcase. Okay... so as of now I only have 1 other MISB toy [Jap. BW Rhinox] but that's where my others are gonna go when they arrive. Right now I alternate between new acquisitions of GIJoe and new TFs; one of these days I should put all my Cybertron guys up there, at the moment all I have is SWTF Obi-Wan and BW10TH Waspinator on the shelf with my two BAT Attack 6-packs and Footloose representing GIJoe. It's sparse, but it brings a smile to my heart; especially seeing my army of Battle Android Troopers. tell your neighbor that I'm a huge fan of his show, MacGyver. Cooool, It will look really nice when you get the other 4. Haha, that's good. I like. Wow that a great Idea Tell MacGyver Thanx. Errrr.... sorry to be the first to say, but that looks kinda lame. Free these toys or stack 'em in your closet. MacGyver, McGyver wherefore art thou, McGyver? Oh yeah.....Stargate:SG1. On topic: I'm definitely gonna make some of these this weekend since I have some boxes I've been agonizing over on how to display. Thanks!